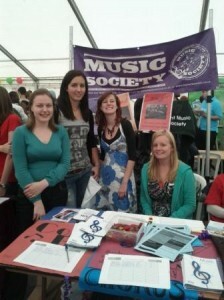 High societies: at the Freshers’ Fayre | Music Matters | Because it does. Doesn't it ? With Freshers’ Week in full swing, the campus is a-swarm with life, and yesterday’s Freshers’ Fayre saw all the student societes attempting to seduce new (and former) students into the myriad temptations on offer by each society as part of the University’s rich and dynamic campus life. 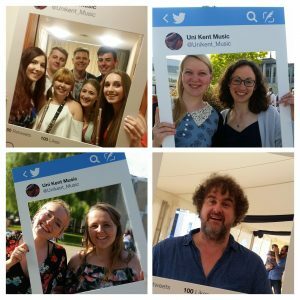 The Music Society and Music Theatre Societies spent the day promoting their respective groups to the thronging masses passing either through the Eliot marquee or the Jarman Piazza gazebo. The Music Society has a brand-new look this year, trending rich purple colourways [is this a fashion column ?] and a new society logo. Pictured left standing their ground amidst the throng on the front-line: Ben Walker (Band Librarian), Chris Gray (President), Matt Bamford (Chorus Rep), Hannah Lilley (Chorus Librarian), Kathryn Redgers (Orchestra Libraria), Nicola Ingram (Secretary), Rachel Richardson (Chorus Librarian) and Adam Murgatroyd (Band Rep) loyally wearing the sandwich-board. Well done to all of them, staunchly manning (and woman-ing!) 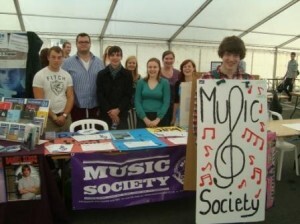 the society stand throughout the day; thanks also to those who also helped but didn’t make it into the photograph! See you all at the Music Social in Eliot Hall on Monday evening for some refreshments, the chance to network like-minded musicians and some live musical entertainment.